Fourth Row Center: Film Writings by Jason Bailey: New on Blu: "Saving Private Ryan"
Steven Spielberg’s Saving Private Ryan begins with one of the most deservedly famous sequences in all of recent film, a vivid and graphic recreation of the D-Day battle at Omaha Beach. He approaches the scene hesitantly, nervously, as the American troops approach the beach; when their landing craft opens up, the front wave of soldiers are immediately dispatched in a wall of gunfire, and Spielberg, in that instant, explodes our war movie mythology. The battle lines are not clean, and “our boys” are losing, badly. This is war—it’s messy, it’s dirty, it’s bloody, it’s brutal. “War is hell” may not be the most original message, but it’s rarely been so vividly illustrated. In that first half-hour or so of Private Ryan, which features some of Spielberg’s most potent and shocking imagery (you can’t shake the way that bloody water drips out of Miller’s helmet, or that dazed soldier, wandering around looking for his own arm), we’re seeing something extraordinary: a good-time filmmaker who knows how to thrill us, casting off his little tricks and going for an effect of pure aesthetic power. There is no exposition (aside from a brief on-screen caption), no proper introductions, and the dialogue is all utility chatter, shouted over gunshots and explosions. For that first chunk of the film, this traditional, classicist director is flirting with a very experimental notion—the kind of “action as characterization” storytelling that The Hurt Locker went almost all the way with last summer. In that way, and in the sheer visceral punch of the sequence (and the one that mirrors it at the picture’s end) is thrilling—just not in the way we had come to expect from the creator of the Indiana Jones movies. In the Omaha Beach sequence, Spielberg never steps wrong; it’s a shame how quickly he loses his footing when it’s over. Some of the expositional shorthand towards the end of it (like the tidy little cans of dirt in the bag of Tom Sizemore’s Sgt. Horvath, each neatly labeled with their country of origin) is a little too easy, but we’re disappointed to discover that Robert Rodat’s script isn’t taking the risks we thought it was with that long opening sequence—he’s merely reshuffling, postponing until after the battle the kind of sluggish exposition and historical pageantry we were so thankful that the picture was skipping. In a snap, we’ve gone from flesh and blood soldiers to speechifying wax figures, none more dull and lifeless than Harve Presnell’s General George C. Marshall, who recites (from memory!) the words of Abraham Lincoln. Yes, we need to introduce the proper plot—that of the three Ryan brothers, all killed in combat within the same week, and the directive from on high to track down the only remaining brother, Private James Francis Ryan (Matt Damon), and send him home—but there’s got to be a more energetic and congruent way to do it than this. When the unit finally tracks down Ryan, he refuses to go with them—his own ragtag unit needs him to stay and defend a bridge from an approaching German reconnaissance crew. The table is set for another difficult battle sequence, but we detour first for the quiet scenes of the men waiting for the Germans to arrive, a calm before the storm. Are these scenes (with the voice of Edith Piaf warbling from a handily abandoned Victrola) too conveniently evocative? Perhaps. But they doesn’t render them any less poignant (particularly when Miller tells Ryan, of a memory of his wife, “That one I keep for me”). The subsequent battle may not be quite as torturous as its first-act counterpart, but it is more emotional—we’ve grown to know these men, and to care what happens to them in terms of their humanity, and not just as human beings. As such, the way that he stops the sequence for that terrifying moment when Upham may or may not have come behind the stairway wall is just excruciating, and when Goldberg’s Mellish is in that torturous battle for his life, we’re holding our breath. Saving Private Ryan isn’t a perfect picture—the symmetry of the so-called “Steamboat Willie” character is too obviously constructed, and I’m still not certain if those bookend framing sequences with the old man in the cemetery work, or are even necessary (though I’m pretty sure those last couple of shots were inevitable even when the film was released). But the picture’s emotional force is intense and relentless enough to overpower its missteps in our memory. At its best, it remains one of Spielberg’s greatest accomplishments. 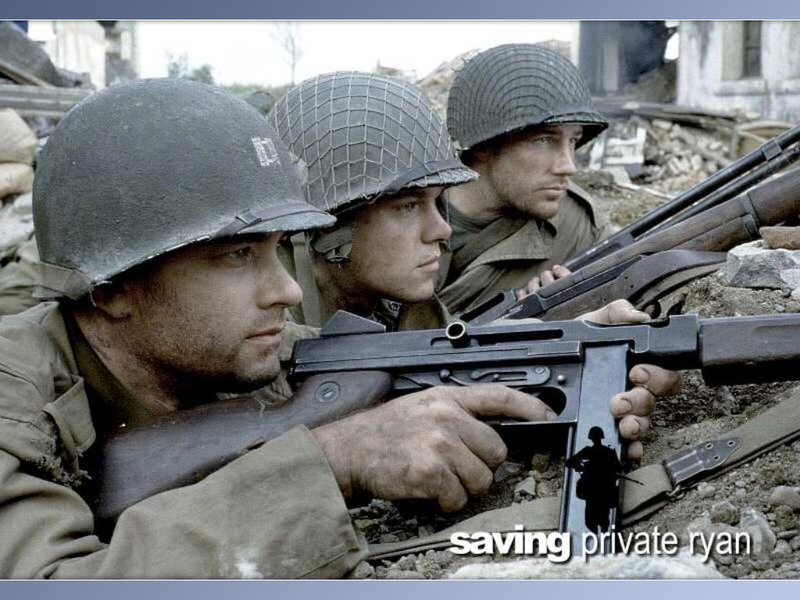 "Saving Private Ryan" made its Blu-ray debut on Tuesday, May 4th. For full A/V and bonus feature details, read this review on DVD Talk.